A few weeks ago I spent one Sabbath day looking over journal entries from 1998. It was eye opening to relive the events of that year from the perspective of my relationship with God. I was amazed to see how far I had come, even more so amazed at how far God brought me during the past 16 years. It gave me another opportunity to thank and praise God for His faithfulness over these years! If you journal, how has it helped you grow closer to God? If you don’t journal, what are ways that help you to remember what God has done in your life? I journal during my personal worship time as well–but I write in a notebook. It has helped me grow closer to God because I think writing things down helps me process things better mentally and spiritually and it allows me to reflect on scripture better. I also like to use it to write down prayers to God, which makes the time more special and draws me closer to Him. I feel close to the Lord when I’m writing out my thoughts and prayers. I find that journaling keeps me focused (and awake!!) if it’s early in the morning. I often pause in my writing to let the Lord speak. 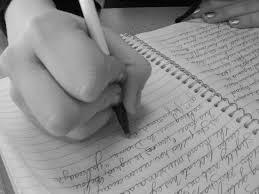 If a thought comes, I write a few words down in the margin of my paper. Sometimes, I journal many pages, other times it may be just a short reflection with more “listening” time. Journaling helps me to quickly connect to Jesus and enjoy time with Him.